We mostly don’t think of how the things we use daily are made. You buy a new gadget, take it out of the box and concentrate on what you can do with it, rather than its origins. We have this subconscious idea that things roll out of a nameless and faceless production line which is there for the sole purpose of feeding our voracious appetite for material goods. 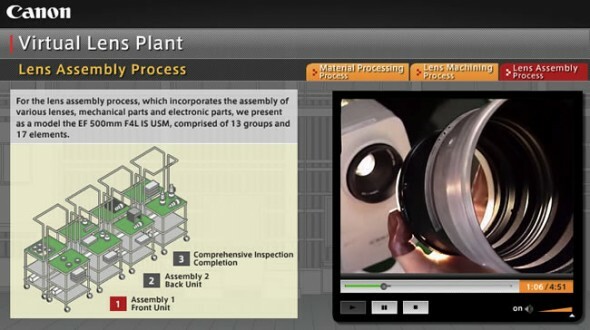 Canon’s virtual lens plant is a series of videos demonstrating the entire painstaking process starting from the raw powdered optical lens material up to the construction of the Canon EF 500mm f/4.0L IS USM lens. It’s a testament to man’s achievement, that we continue to evolve. It’s technology and engineering that have become part of human culture, pushing our boundaries as humanity forward. We have evolved from making basic tools for survival to precision instruments such as these. After watching the full nineteen videos, I’m again reassured of humanity’s progress and technology’s role as an agent for progress. Click ENTER on the virtual lens plant and be sure to check out the interviews of the people involved in making these lenses.